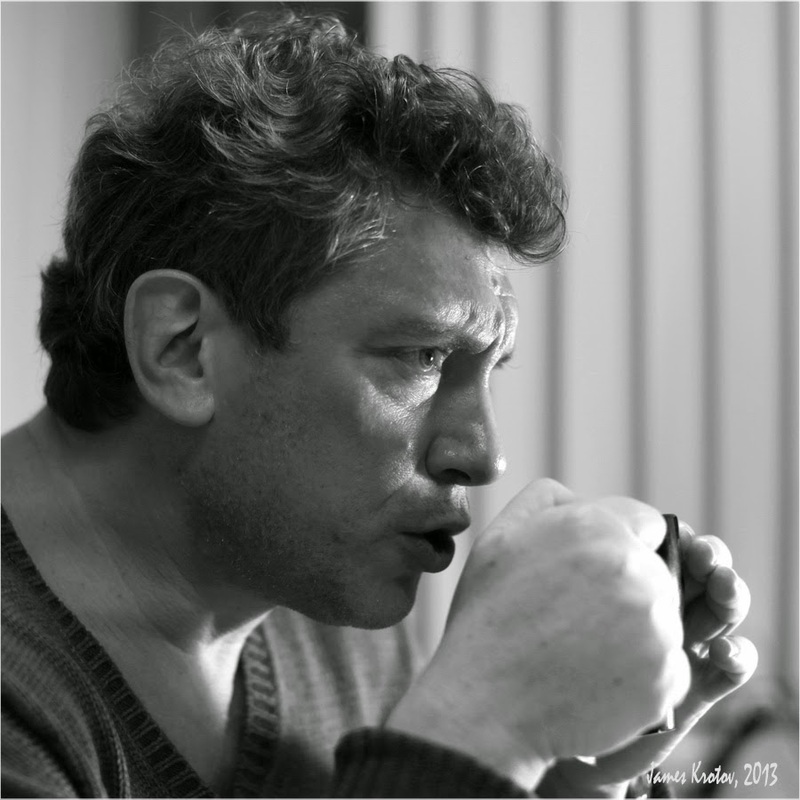 Boris Nemtsov. credit: James Krotov; source. Back in 1994, when I was working for Friends United Meeting at its Richmond, Indiana, offices, Bill Wagoner and I visited Richmond's sister city of Serpukhov, Russia. We met a wide range of citizens in Serpukhov, including teachers, librarians, artists, and representatives of the city's Vysotsky Monastery. We were even interviewed by a local radio station. One of the local citizens we met on that trip was a young journalist. She asked us about Richmond, about how we saw Russia, and what our motivations were for visiting. I had a chance to ask her one of my own standard questions: who or what were her sources of hope. She didn't take long to give me a name: "Boris Nemtsov--he's the governor of the Nizhni Novgorod area, and he's carrying out all sorts of marvelous reforms. A lot of us hope he's got a future at the federal level." (I'm recalling from memory.) I wasn't sure who she meant by "a lot of us," but I had the impression she was referring to her peers, young professionals who in the chaos of those early post-Soviet years were able to perceive a hopeful, "normal" future for their country. I thought of that journalist a couple of mornings ago when I was watching the memorial meeting for Boris Nemtsov held at the Sakharov Center in Moscow. A reporter was interviewing people waiting in line to enter the assembly hall. One middle-aged woman, Valentina, came to the microphone and said that she was "a person of the 1990's. In those years we had enormous hope, simply enormous. And of the people of that time, he [Nemtsov] remained. Many of them--of course, not all--now work in the system. He was one of those who continued the struggle for freedom." My point here is not to assess whether Nemtsov always worked correctly or effectively for freedom, or whether those who went into the "system" are all against freedom. Those kind of glib generalizations I'll reserve for paid commentators. But what struck me was that this woman, Valentina, could have been that same young reporter twenty-one years later; in any case, they were contemporaries. I found that Serpukhov reporter's intelligent optimism very attractive, and it's easy for me to believe that there must be thousands, maybe millions, like her in Russia who now are united by a common grief. It's not necessary to analyze all the politics of this difficult moment to acknowledge and respect that grief. At the site of Boris Nemtsov's murder, one of his prominent friends within the system, Anatoly Chubais, pleaded for all sides in Russia's political life to calm down and cool their rhetoric. As a modest contribution to that effort, here are a couple of calm links I found through Sean's Russia Blog, both from the commentator Mark Galleoti: Known Knowns and the Nemtsov Murder, and If the Hit on Boris Nemtsov Was Meant to Intimidate, It Failed. Unfortunately, Chubais's plea has mainly been ignored. Here in the USA, coverage of the tragedy has quickly focused on suspicions of Kremlin villainy. There is nothing wrong with serious and sober analyses of the factors and forces that might have led to Nemtsov's death, but the relentless and sanctimonious Russia-bashing of the West, as Tim Black observes, "... makes mature diplomacy, in which opposing interests are calibrated, and compromises struck, increasingly impossible." Heartfelt grief, yes. Honest and persistent demands for justice, yes. Telling the truth about the power politics of any nation, certainly. But the "easy demonization of Putin's Russia" doesn't really serve these causes. Video of the memorial meeting and the line outside the hall (Russian).